What's so remarkable about the object in the center of the above photograph? For one thing, it is very bright, considering it is about twelve billion light-years distant--so bright that, for a second or two, its light equaled the combined light output of the rest of the universe! This is the optical transient counterpart of a tremendous gamma ray burst (GRB). During a brief 50-second time span, this GRB released as much energy as several hundred supernovae, making it the most powerful explosion known in the universe since the original Big Bang. GRB 971214 is so named because it was detected on 14 December, 1997, by the Italian/Dutch BeppoSAX satellite and NASA's Compton Gamma Ray Observatory. This image was made by the Keck telescope. Since 1967, GRBs have posed an enigma to astronomers. What is the nature of these tremendous explosions? Alternate Site This site is created by Robert J. Nemiroff and Jerry T. Bonnell. At Robert's site you can also take virtual trips to a black hole and a neutron star. This requires an MPEG player. I recommend Intervu's FREE EyeQ multimedia plugins. The Astronomy Picture of the Day Calendar This calendar is generated by a robot written by Miss Momoko Sudo. NEAR Image of the day NEAR (Near-Earth Asteroid Rendezvous) is the first artificial satellite to orbit an asteroid. See the first close-up pictures from its orbit around the asteroid Eros. NASA's Planetary Photojournal This site provides you with easy access to publicly released images from various Solar System exploration programs. Mysteries of Deep Space The website for the PBS series. Lots of interesting info, Q&A, trivia questions, and a screen saver, among other things! LIGO Project Home Page The Laser Interferometer Gravitational-Wave Observatory (LIGO) project is a pioneering effort to design and construct a novel scientific facility--a gravitational-wave observatory--that will open a new observational window on the universe. Extrasolar Visions Ten confirmed extrasolar planetary systems (so far). Some facts about them, along with some speculation about the nature of these worlds. Why not? Check out this very visually appealing website with stunning computer artwork by John T. Whatmough. A Tribute to Richard Feynman This site has a lot of good Feynman links. The link I had previously included, "Richard Feynman Online," is offline! Cosmos in a Computer Witness the birth of the cosmos, watch the universe unfold, all from your desktop. The Home Page See what's happening today at NASA! Now you can search hundreds of thousands of documents in all of NASA's web sites from one place with their new search engine. The Strange Case of Eta Carinae Two sites where you can learn more about The Mother of All LBVs! It's one of the most massive and luminous known stars in our galaxy, and therefore the least stable. It also emits UV LASER light! The Pistol Star This is a contender for the cosmic superheavyweight title. It is the most luminous star known (a Luminous Blue Variable, or LBV like Eta Carinae), and is very unstable, spewing out great gobs of energy and matter. The Pistol Nebula is confirmed to have originated from the Pistol Star. The Solar Image Index Our own star, Sol, is a rather unremarkable yellow dwarf star, but there's something to be said for predictability and stability, especially when you're talking about the star upon which we depend for life-sustaining energy. This site contains images of the Sun taken daily by The Space Environment Center. STScI (Space Telescope Science Institute) This is the organization responsible for the Hubble Space Telescope. NASA's Home Page The Jet Propulsion Laboratory also brings you the latest updates on El Ni�o. The Laws List What is the Eddington limit? What's so unusual about Schroedinger's cat? Now you need wonder no more! Autodesk founder John Walker's web pages This site defies classification, but it is chock-full of cool stuff like C-Ship, which puts you in the driver's seat of a spacecraft flying at near-light speed! You can experience Einstein's theory of Special Relativity firsthand. John's vision of the next industrial revolution, Nanotechnology in Manufacturing, is also fascinating reading! Views of The Solar System This outstanding website was created by a BYU alumnus, Calvin J. Hamilton. The Nine Planets This site is created and maintained by Bill Arnett. 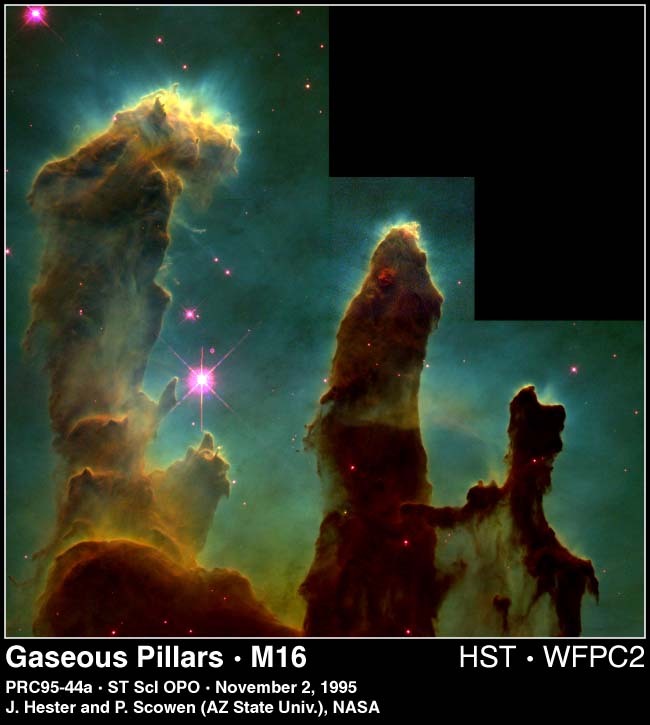 M16 (The Eagle Nebula) Lays Some EGGs HST gives us a fascinating glimpse of star formation as it happens! The Deep Field Hubble Space Telescope Astronomers pointed the HST at a very small, relatively clear area of sky in the vicinity of Ursa Major (the Big Dipper), exposing the image over a 10-day period. The faintest objects in the resulting image are 10-15 billion light-years distant--almost to the beginning of the observable universe, within one billion years after the "Big Bang". 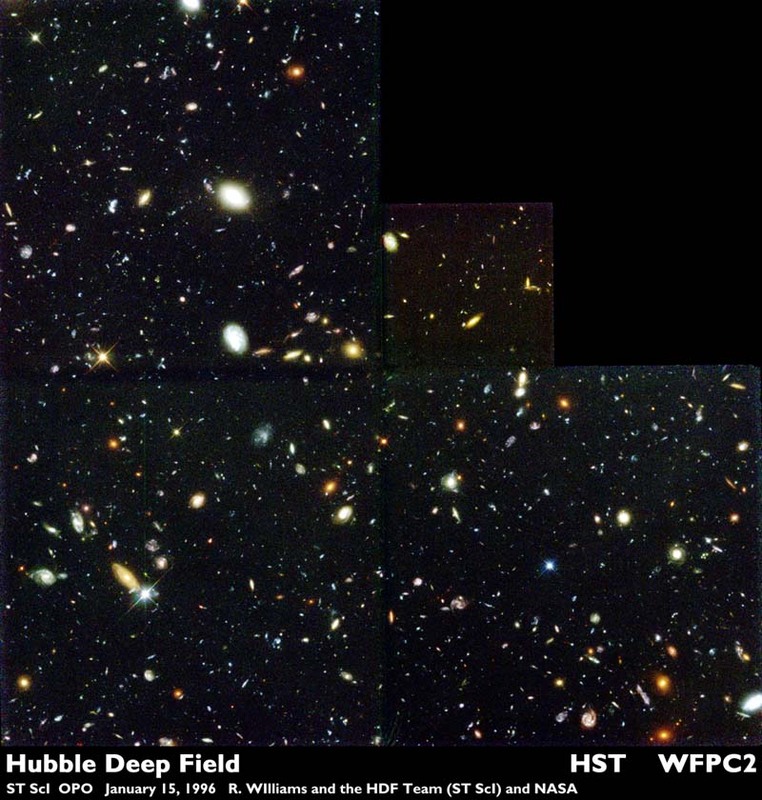 Click on the image of the Hubble Deep Field to see a larger view. If you're feeling up to it, view the full-resolution JPEG image (3069x3100 pixels, 2.1 MB).